Come join us in the arcade for our annual Holiday Festival! New Entry Fee For This Year* : Each guest must bring NEW or gently used Coat for our Coat Drive and Non-Expired canned goods for donations. Come dressed in your best holiday attire, Ugly Sweaters are welcome! Prizes for different categories! Holiday festive crafts you can take home! Fun games and of course our winners win prizes! And Of Course a Visit from Santa! 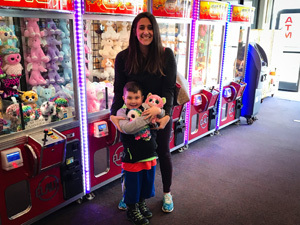 Come join the fun and start your Holiday fun with us at Casino Pier! Please do not forget your donated item for entry to Fulfill Monmouth & Ocean Counties! We would hate to turn you away from all the fun!